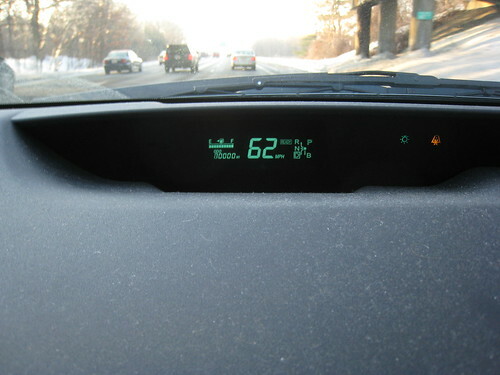 Just hit 80,000 miles on my 2004 Prius! Actually looks like the odometer has a little burn-in, the "7" part of the first digit is brighter than the rest of the "8". Prolly will normalize after some use. 80,000 miles at an average of, let's say 46 MPG (it tends to be around that), that works out to about 1,739 gallons of gas. Damn, that's a lot of gas! Not sure what the average price of gas has been over the past few years, let's say $2, that works out to about $3,478 in gas. If I'd had a lower MPG car, let's say 25 MPG, the gas would have been $6,400. So the Prius' higher MPG has been a savings of $2,922 so far. Plus the emissions are lower on the Prius, so there's that, too.